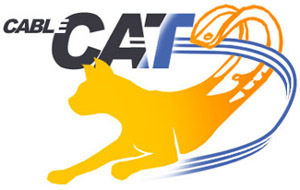 CableCat provides support of high-performance cabling including Category 5 and higher speed copper cable, Fiber optic and innerduct. A variety of sizes are available to accommodate up to 425 four-pair UTP. This is a cost effective alternative to cable trays. Factory or field made assemblies allow for attachment to virtually any structural member. The first wide-base J-Hook assembly was specifically designed for high performance telecommunications cabling. The "original" CADDY CableCat J-Hooks, with 1-5/16" and 2 " diameter loops, have expanded into a comprehensive line of solutions for any application. The wide-base J-Hook provides proper support and routes cables with a sufficient bend radius to prevent pressure on cables. This new size was designed to comply with the current 1997 TIA standard 569-A, which allows for attachment to ceiling wire and grid. Factory assemblies are also available for attachment to other structures. The CAT12 size J-Hook holds up to 16 four-pair UTP or fiber optic cables and is equipped with a unique bend-back tab to provide containment without pressure on cables. Now providing the widest support available in the CableCat family, the new CAT425 can adjust to a 4" or 6" diameter loop. This flexible cable wrap can hold up to 425 four-pair UTP or fiber optic cables and quickly attaches to beams or purlins. It's simple locking and unlocking feature allows for the addition of cables without a hitch, and cables pull easily through the closed support system. This Cat is suitable for air handling spaces (plenum) for loads up to 100 lbs. The CableCat J-Hook is now available for raised floor environments. Cables are easily organized off the floor and the wide-base J-Hook provides a cost-effective alternative to cable trays. This underfloor CableCat is pre-riveted to a fully assembled fastener ready to attach to the floor pedestal. Now from roof to floor, ERICO has a CADDY CableCat solution to fit.